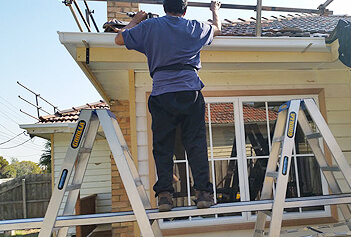 With more than 20 years of experience Santuru Home Improvements provides all of your roofing needs. Your satisfaction is our priority. Our staff is dedicated to excellence, offering you the up most quality. Our mission is to provide you with the roof of your dreams. 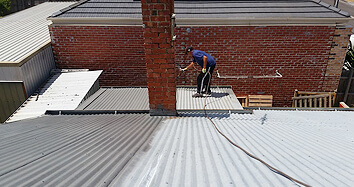 Our dedicated staff of trained industry experts specialize in roof restoration, metal roofing, roof repairs, tile roofing re-bedding services, roof color services, and gutter services in Melbourne and surrounding areas including Keilor, Tailors Lakes, Sydenham, Essendon, Tullamarine. We exceed industry standards by using tried and true high quality products, and offer them at competitive prices. We at Santru understand the benefits of new and improved roofing. From increased home value, protection from the elements, to simply a change in décor. Leading in safety we protect your structure by always inspecting job sites. We apply rope and harness system and/or installing safety rails in accordance with national safety standards. Your roof is in the best hands when it’s in Santuru’s hands. To ensure your confidence in our products and services we are registered with H.I.A. (Housing Industry Association) and are fully insured. We adhere to their strict safety policies and guidelines according to the National Code of Ethics important to all Australians. To maintain your trust we offer you a 100% satisfaction guarantee. If you’re not satisfied neither are we. With quality workmanship and affordable prices we aim to please. Remember “Your roof protects your asset. We protect your roof.” Lets us protect your roof today!